WALK TO THE BRADENTON BEACH!!! Spacious 2BD/2BA unit accented w/ nice lake view! 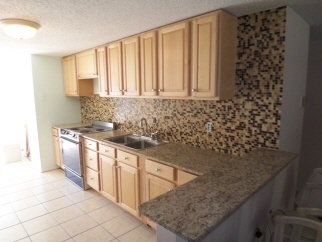 NEW Maple Kitchen w/ Granite counter tops, bar seating and custom glass tile back splash!! Freshly painted inside and out, laundry area in unit, foyer entry, eat-in kitchen, breakfast bar, lakeview from master, partial fenced back yard, low homeowner association fees and more! Easy to maintain and in great location near shopping, restaurants, schools & beaches. Interior Features Brand New Maple Dream Kitchen w/ Granite bench tops and Custom Glass Tile Back Splash. no worries about exterior, association maintains roof, paint, exterior, lawn for $135 per month. Home has good sized rooms and walk in closet in master bedroom. Amazing custom dream kitchen.